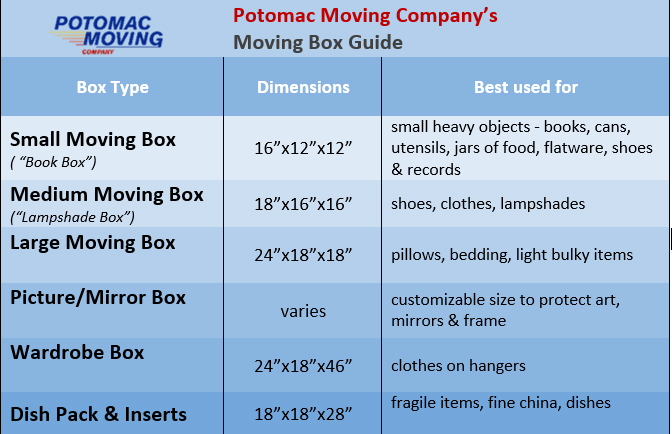 We get this question a lot – so much that we decided to put together this quick reference guide to help everyone get a better idea of how figuring out the right amount of moving boxes works. The truth is, most online packing calculators are completely useless. There are a ton of them online but unfortunately most of them are not even remotely accurate, because they are based on the number of rooms. There isn’t a standard size for a room, all rooms are different. The number of boxes needed to pack a small apartment bedroom will be quite different from that needed for a huge home office of a larger house. Unless you come across a calculator that factors in the square footage of your home and asks for basic inventory of your belongings, don’t waste your time. Our advice: get an idea of how many moving boxes you will need based on square footage of your home below. Make sure the place you buy your boxes from will accept return of any unused moving boxes in case you have some left over, and buy a little over recommended amount. You don’t want to waste your time running back to store to get more boxes in the middle of packing. 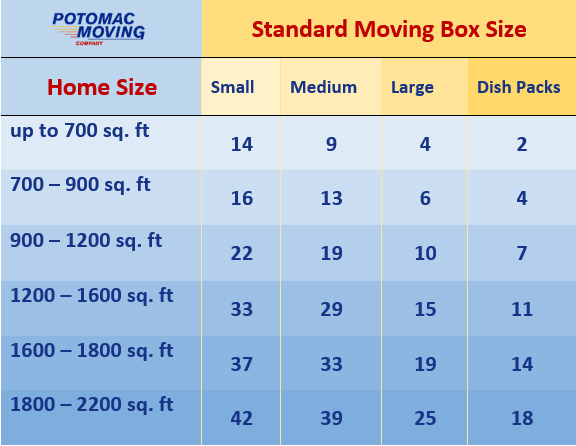 Prioritize buying small and medium sized moving boxes as those are the most handy sizes overall. Most reputable moving companies, including Potomac Moving Company, will pick up and refund any unused boxes you purchased from us at the end of your move. Potomac Moving Company is a local certified professional mover located in Fairfax County, VA and proudly serving customers in the greater Washington DC area. We also offer professional packing & moving services and carry a wide range of competitively priced packing materials. You’re welcome to check out the Frequently Asked Moving Questions Section on our website for further information. If you would like to know how much your move will cost, please submit the Moving Estimate Request and we will get back to with your personal quote right away!